Two NGL vibroseis trucks were used to conduct a 2D survey in the south-west of Western Australia in December 2012. The survey is part of the South West Hub Carbon Capture and Storage (CCS) project coordinated by the WA Department of Mines and Petroleum to assess the viability of commercial carbon storage in the area. Vibroseis trucks are one of the tools used for conducting seismic surveys to uncover details about the subsurface geology of an area. When used in the field, the seismic waves emitted by the truck bounce off rock formations underground and the returning signals are collected by geophones at or below ground level. The gathered data are then processed and analysed in order to determine the depth, structure and rock properties of the different layers. These results are used to generate maps of the subsurface, with the information checked against observations in wells drilled nearby. 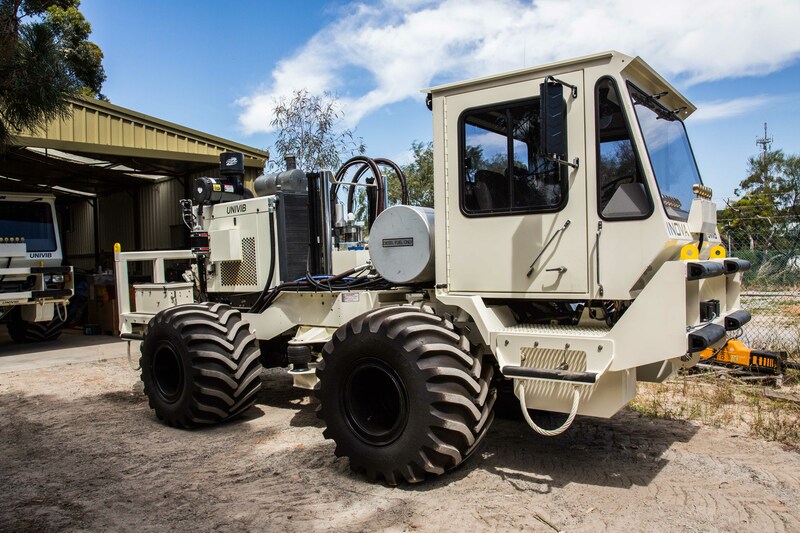 NGL has procured two vibroseis trucks and at 11 tonnes they are one of the smallest seismic trucks on the market that can be used to obtain images to several kilometres depth. With a width of less than 3 metres the trucks can pass through ordinary gates without needing to cut fences. The trucks also have specifically designed tyres to minimise soil erosion and are designed to have minimal impact on the environment and local community. While there have been other seismic surveys in the area, this particular survey provided more detailed mapping of formations closer to the surface. The survey was designed to look at a shallower depth for layers that could act as barriers or baffles to CO2 migration and to see if there was evidence of any near-surface faults. This information helps the researchers to understand if there is any risk of CO2 making its way to the surface, information which aids in decision making for the project’s overall feasibility. The other seismic surveys conducted in the area were more focused on characterising the potential injection reservoir that is far deeper. There are plans to conduct more surveys of the area to determine whether the site is suitable for carbon storage. The results of the 2D seismic survey also contributed to the design of a 3D survey conducted in the area that was completed in April 2014. Further seismic surveys help to develop a detailed map of the subsurface of the region and determine if it is suitable for storing CO2.